Four under bed storage drawers with euro glides. The Starting Price is for Queen size only. Storage Contemporary style Bed in Grey is a stunning practical bed with an elegant simplistic design. This bed is upholstered in fabric upholstery, and the frame is made from wood. Bed includes four under bed storage drawers with euro glides. Contemporary Style, King or Queen size. White tufted leatherette headboard, Blue Led lights. 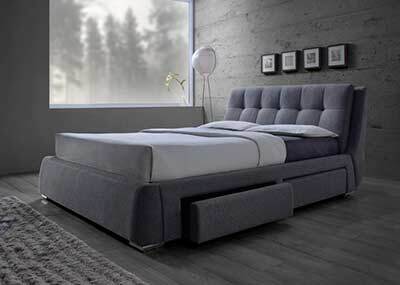 Lift-top hydraulic bed frame, Padded headboard. Metallic Silver Fabric, Button Tufted.